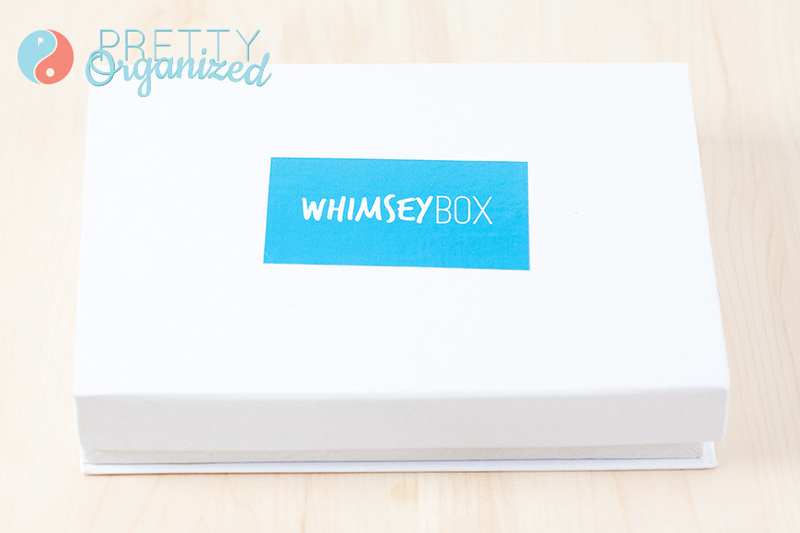 It all started when the lovely folks at WhimseyBox were giving away a few of their boxes. They already have magnetic closures and pretty silver label holders, making them perfect for repurposing into organized storage. Pretty little storage boxes? For FREE? Yes please!! I took one look at my pile o’ craft supplies and had an idea. 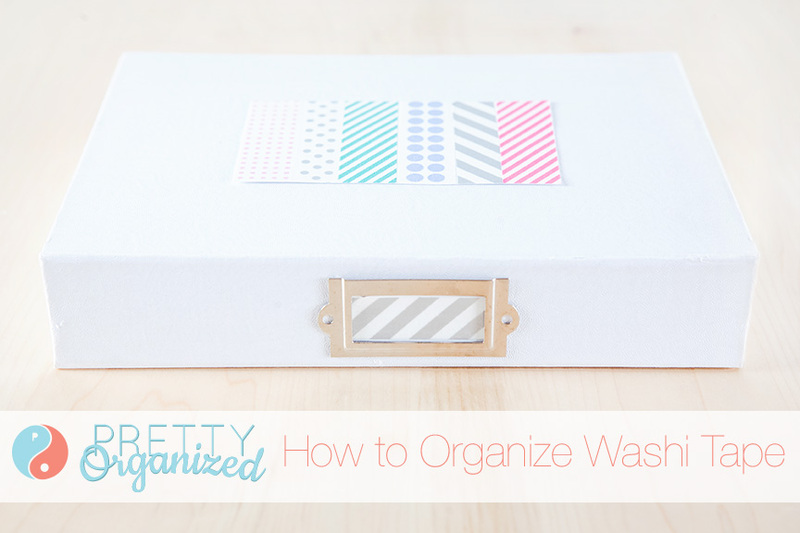 Prepare to be Washi-fied! 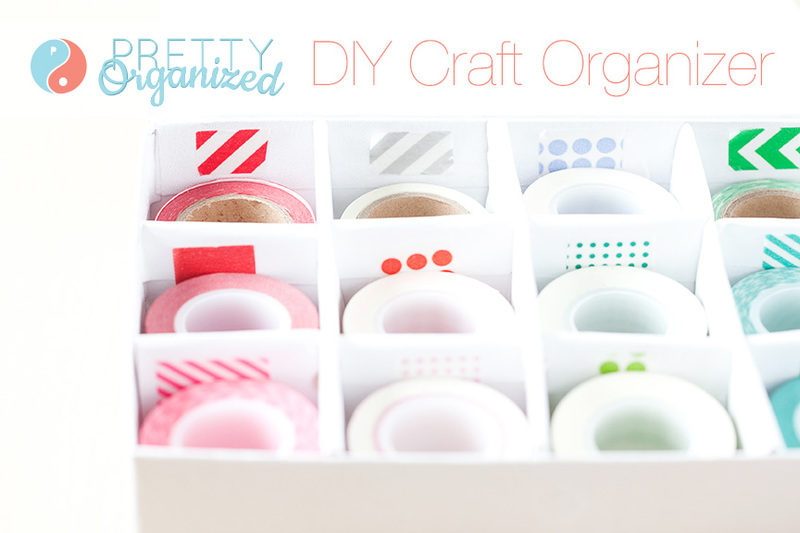 Yep, I repurposed that box & made myself a pretty sweet little craft tape organizer! I measured the box & cut pieces of cardboard to create dividers, following a tutorial I found here. 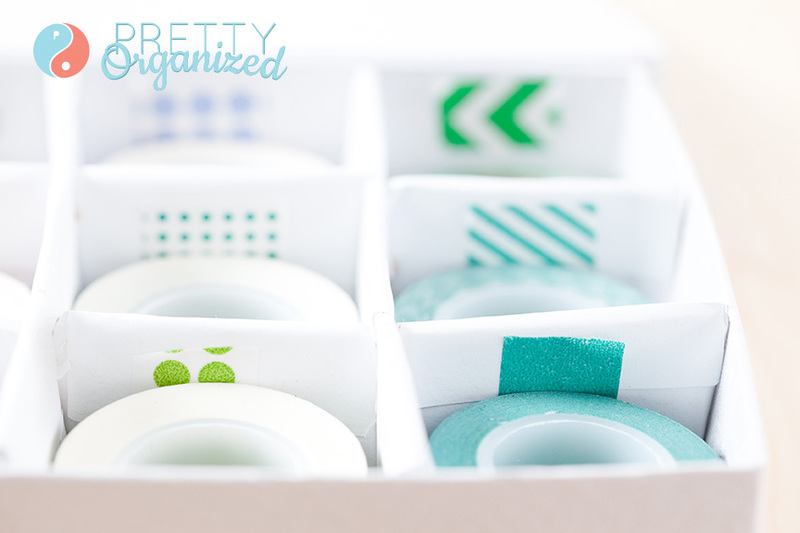 Then, I covered the dividers with white shipping labels so that my washi labels would be easier to see. You could probably use any kind of paper or cloth to cover it, but the shipping labels were a good size & they already had adhesive backs — DONE! I used a little piece of Japanese tape from each roll to label where they belonged, placing labels on the bottom & near the top so I could see them from any angle. A few of the rolls were small enough to stack two deep, so I labeled the bottom roll at the bottom & the top roll at the top (a life-changing revelation, right?). I also stacked like colors together to make it easier (and prettier!) when I grab a roll of paper tape. Aaand I created labels for the top & sides of the box. 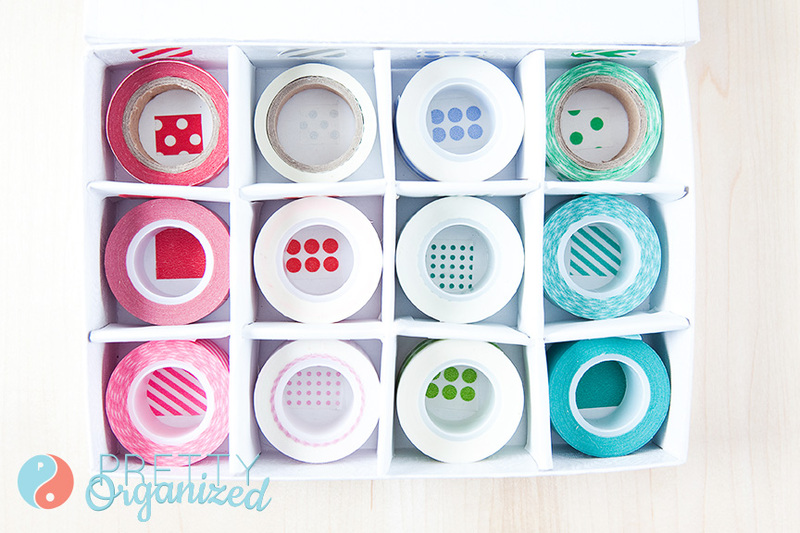 The washi tape provides cute, clear visual cues — no words needed (except for my caption, haha)! Super easy, pretty, and small-space friendly! I love it! 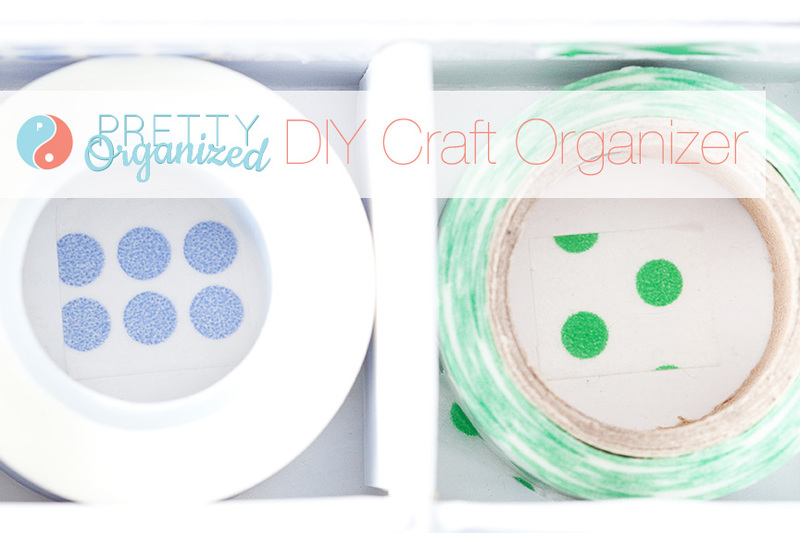 UPDATE: WhimseyBox loved this little project so much that they featured it on their blog! Click here to see this & a few other great repurposing ideas! Thanks so much! Haha it is addictive!! I know I shouldn’t even start in this direction since we’re downsizing, but let’s say a “friend” was looking for washi tape… what’s the best priced resource – Michael’s? Online? Japanese store? Ha! I haven’t priced it out very much, but I have seen some great sales at Michael’s & there are always a ton of options on Amazon. I’ve also purchased some cute ones at Target & I think DowntownTape.com has a lot of adorable styles! If your “friend” finds any really great deals, please keep me posted!